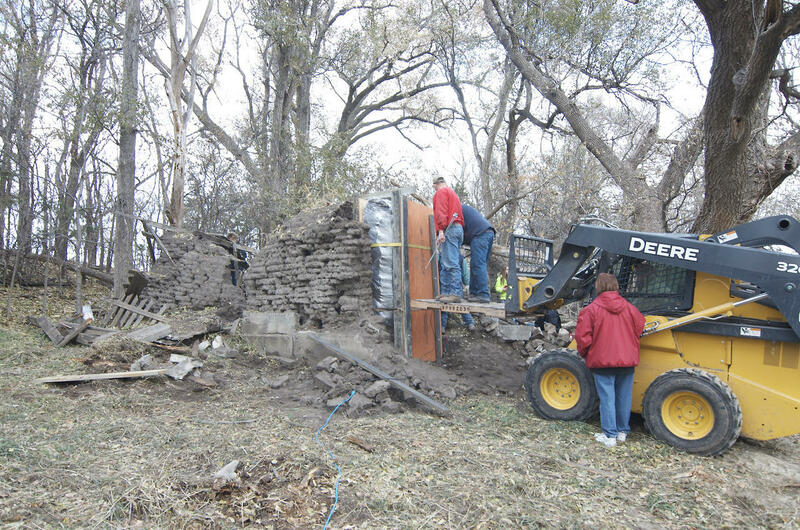 Researchers prepare to take down a section of a sod house in Gates, Neb., in order to study the bricks made of dirt. Ecologists in Nebraska are trying to find out what the Great Plains looked like when homesteaders settled there in the 19th century. To do that, they’re working with a team of archaeologists and historians dissecting a sod house, a house built out of bricks cut from dirt. Larry Estes has had a sod house in his backyard in Gates, Neb., for as long as he can remember. He never really thought anything about it until a year ago when a repairman asked him about it. It’s important because, for a team of scientists from Lincoln, Neb., the sod house represents a snapshot of prairie life from more than a century ago. The scientists want to dissect a whole wall – take it apart and analyze everything inside it in a kind of autopsy. They got it to work – eventually. It ended up taking about three hours, and a couple of near misses with a tree branch. The wall eventually was placed on the back of a flatbed tractor trailer, packed between two wood pallets and wrapped in plastic like a giant ice cream sandwich. LuAnn Wandsnider is a professor of archaeology at UNL and one member of the autopsy team. She wants to know if the sod house can tell a more detailed story about homesteaders in Nebraska. We know some things about life at the turn of the 20th century, but there’s a lot we don’t know, too. “It’s a laboratory that we can kind of look to see over the course of hundred years, what happened as people dealt with changing economic situations and as droughts came and affected them,” Wandsnider said. It could help current farmers on the Plains cope with drought and deal with climate change in the future. The wall was in storage on UNL’s east campus for most of the winter. In March, Wandsnider and Carter joined Dave Wedin, a grasslands ecologist at UNL’s School of Natural Resources, to start the autopsy. Even though the wall comes apart pretty easily, the bricks themselves are really sturdy. The roots are from the prairie grasses that were growing in the dirt before the dirt became building material. The sod is a kind of time capsule from a hundred years ago. According to ecologist Dave Wedin, the density of the roots in the sod bricks are what makes the bricks so sturdy, even after 110 years. Wedin tested the integrity of the sod by submerging a block in water - it had yet to dissolve after three weeks. 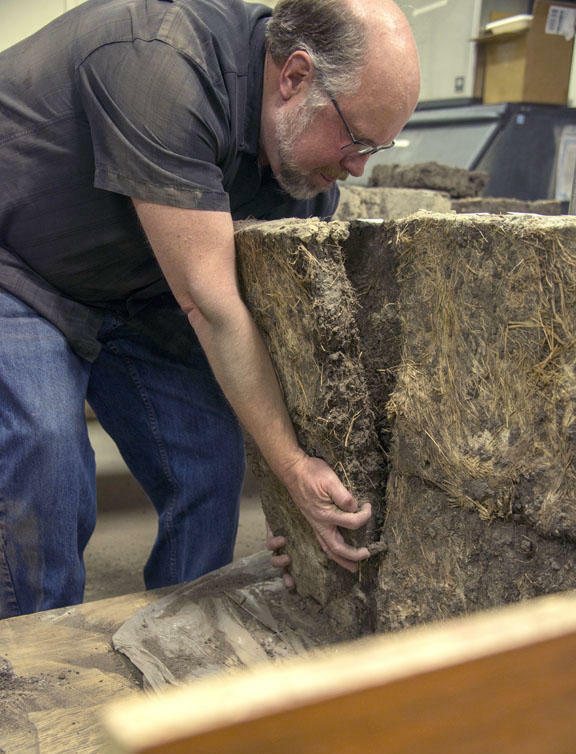 Wedin will use modern techniques to analyze the sod bricks to get the same kind of information we have about the prairie today. 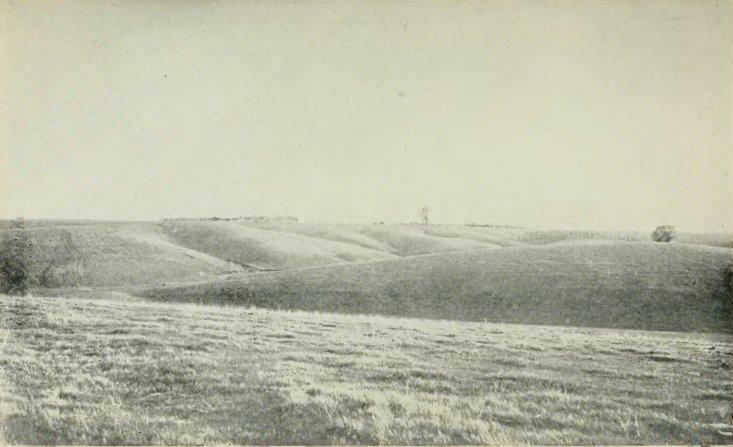 Those details might sound trivial, but they can help scientists see how much or how little the prairie has changed in the past century. Plus, with so much extra sod, they have room to experiment. They’re even watering a section of sod to see if any of the roots can take hold and grow. The autopsy is going to take a long time. The team still has to peel apart the rest of the bricks and divide them up among the labs doing analyses, and there’s still more than half the wall to go through. It will be a while before they get any results. But even though the autopsy is still in its early stages, Wedin said it’s already producing something valuable – collaboration between different kinds of scientists. 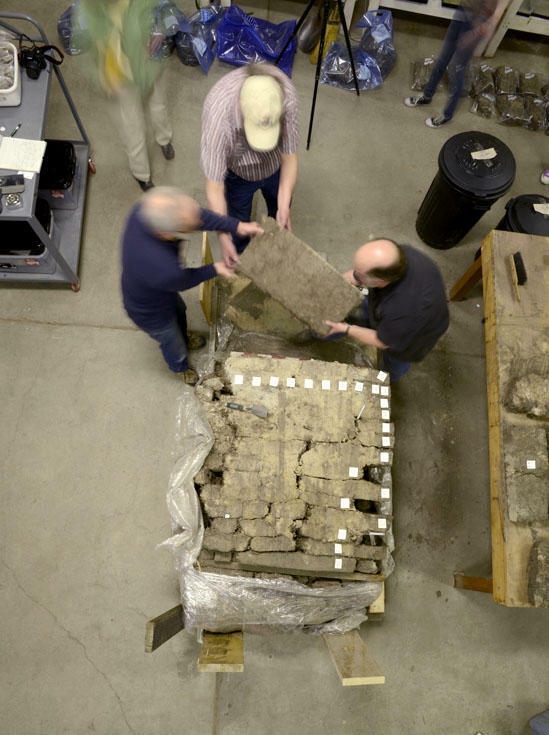 The wall, partly unpacked, is stored in a service shed on the University of Nebraska-Lincoln campus. The shed also serves as the laboratory for the autopsy team while they separate the sod bricks. These findings may only apply to this one specific area of the prairie and to this one specific sod house. But they’re hoping scientists and researchers can copy their techniques with other sod houses to help get a better picture of the past all over the Midwest. This story first appeared at NET Nebraska. The world’s soil is in trouble, even in the fertile Midwest. Some experts warn that if degradation continues unchecked, topsoil could be gone in 60 years—with implications for agriculture and the broader environment. Jerry Twedt’s great grandparents, Ole and Helena Branjord, settled on the Iowa frontier in the late 1860s. He has researched his family’s history and turned it into a novel. Host Charity Nebbe talks with Jerry about his novel “Land of Promise, Land of Tears”, and the fictional world he built around his family’s true story. Later, Charity talks with Teresa White from Usher’s Ferry History Village in Cedar Rapids and Dan Jones from Living History Farms in Des Moines about camp opportunities for young people to live history this summer. 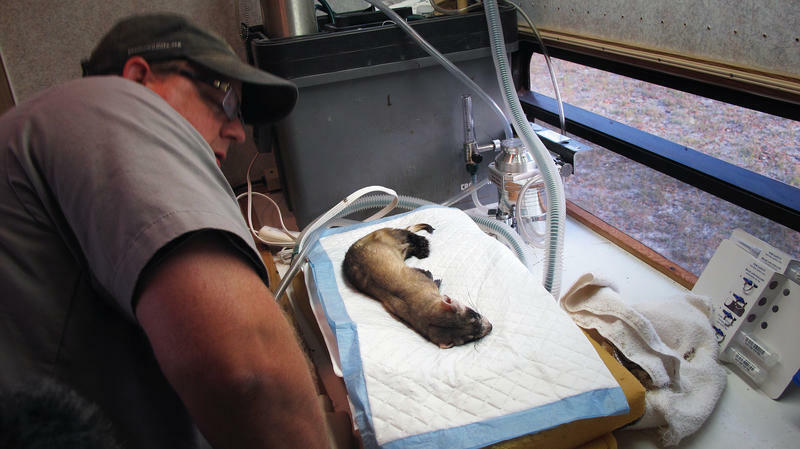 Some biologists are trying to save the prairies and they've picked a hero to help them: the black-footed ferret. In trying to save this long skinny predator with a raccoon-like mask, the biologists believe they have a chance to right a wrong that nearly wiped a species off the planet.